What a lovely weekend. Yes, it was a drizzly mess. Yes, I had to work a bit, and still do (which is why this post is going to be short but, hopefully, sweet). Yes, mum has flown off for my brother’s graduation down under and I’m staying behind. But it’s also been full of smiles, love, and special times. A rainy market morning with less people and more time to meander and chat with purveyors. More micro arugula! A pause in the rains just enough to have swim class…and some vigorous kicking finally (notwithstanding the absence of, up till now, blowing bubbles). A nap (oh yesss)! A rollicking family dinner with fantastic food (the men in my family are awesome cooks) and catching up. An impromptu hubs-and-me Sunday breakfast. A christening of dear friends’ long-awaited little one, with C standing as one of the godparents. A new word for little C (“pata” for pasta). And, although I am far away, my baby brother is graduating film school. My heart is bursting with the joy and pride of it. – Beat the eggs lightly with a fork just until homogenously yellow. – Heat the butter and oil in a non-stick skillet. When the butter has melted and the bubbles subside, pour in the egg. – As the bottom of the egg sets, push gently with a wooden spatula towards the middle, letting the uncooked egg run underneath. Keep doing this slowly and methodically until you have very softly set curds of egg. I usually take my pan off the heat in the middle of all this to avoid overcooking the eggs. I like my eggs runny. – When the eggs are partially set but still wet in places, add the avocado and fold gently. – Take the pan off the heat (if you haven’t already) and pile the eggs onto the toast. Sprinkle generously with sea salt flakes and freshly cracked black pepper. When I saw this dish in the kitchn I knew I had to try it. It is luscious, creamy on creamy, cozy made edible…perfect on a rainy morning. Perfect on any morning truth be told. So easy to whip up that I’m a touch embarrassed I went and made a recipe out if it. Really, just make the scrambled eggs the way you do best and fold the avocado in. You won’t be sorry. Unless you don’t like avocado. Then try this instead. Yes, this post is short, but it is indeed packed with such sweetness, not the least of which is this deliciously simple dish. This is on the menu for our next lazy Sunday breakfast! Little C is adorable. My boy's first word was "yum" 🙂 and oh these eggs: can't wait for tomorrow morning. This looks like a great Sunday morning dish! why didn't I think of this? Wonderful! 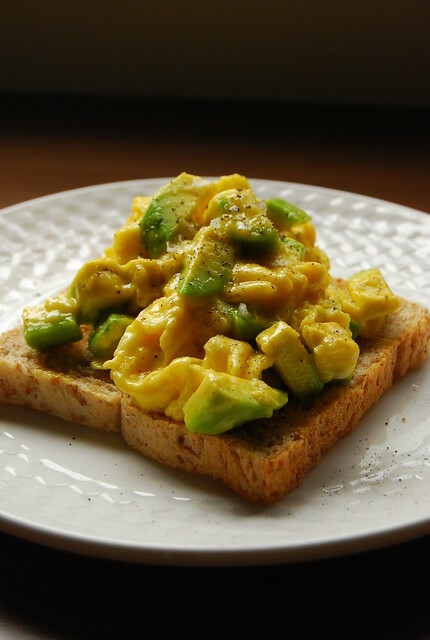 scrambled egg and avocado is an interesting combination! Hi, ChichaJo! I've been following your blog for a little while now but this is my first time posting. This recipe looks sooo good! Delicious 🙂 Your blog is really great, congrats! What do you think about using duck eggs instead? I saw some last friday at Blue Kitchen, Rockwell for P295 a dozen. Do you want to split these with me? Never thought of this combination but I'm sure it's great! Hello Weekend Gourmet! Thank you 🙂 Her first word was "mama" 🙂 🙂 At least that's what I tell everyone! Hi Anh! It's so simple and so good! Hi Mitinita! I didn’t either until I chanced upon it online…so glad I did! Hi Entrepgirl! Yes…there is more you can do with avocados now 🙂 So happy as I love them too! Mmmm…. that looks like pure comfort food! They has to be the best looking chic scramble I've ever seen, and I want some! Totally gourmet, I think I might ask the Mr. for service in bed ( breakfast in bed).. I'm off to hunt for some avocado!!! Even though it is raining, having such a warm breakfast. I am sure, a warm and lovely day is waiting for me. Although it is midnight now, I can't wait to cook my breakfast and my mouth is watering. This looks so fluffy and creamy and delicious. Yum yum yum. I've had an avocado omelette before, but I somehow think this would be nicer. I love the idea of a blog dedicated to breakfast! It's the best meal of the day! I can think of only one thing that can go so perfectly with this breakfast: BACON! Tried this, and oh, my, my… heaven! We have an abundance of avocados, thanks to this week's organic vegetable delivery. We're finishing off the last two, so they'll be perfect for brekkie tomorrow! Hi Martine! Yes, so happy to find avocados in my basket…glad you enjoyed this too! Hi G! It is good in lots of other ways too, although I do enjoy a good, creamy avocado shake 🙂 Zamboanga is truly special and I hope we can visit soon again! I wish I'd found your blog a long time ago: I often find it difficult to get inspiration for breakfast – and this one would be great as a lunch too, or a light meal anytime. I just tried your recipe, perfect breakfast for sunday morning.